Photo by Jim Grant, who wrote: I was at the OB pier and heard this stripped down version of Freebird being played. 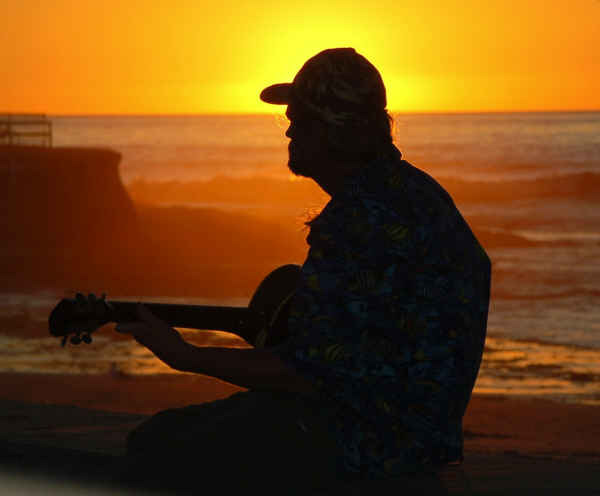 This guy was playing a Dobro sitting on the seawall watching the sunset...it was pretty darn cool. In the midst of the Great Recession, four new businesses are braving the wind and have opened or are about to open on Newport Ave, OB’s main business street. The Wellness Center has opened in the old hardware storefront. They offer a variety of hemp products as well as herbal medications in a pharmacy to the rear of the store. Next to the OB Surf shop, the Green Lady Hydroponics will be opening in mid-December, we’re told by the owners, Travis and Don. Their mural-like sign was being painted the other day when we stopped by. Why the hold up? They need to stock up, they said. They will have live hydros in the front windows. Another new store that has opened, MisMatch, is run by two sisters Tolly and Iris. They are in the old tanning salon at 4932 Newport. And finally, the new Italian restaurant Ciao Bella, has a new exterior paint job, and appears to be on the verge of its grand entrance to the community in the coming weeks. Join our health care vigil to remind Congress not to bargain away real reform. It will be held at the UCSD Medical Center Hillcrest at 5:30 PM. Conservatives are pushing to bargain away the heart of real reform—the public option. So we’re organizing emergency vigils nationwide to send Congress a powerful reminder that a majority of Americans want a public option—and we won’t let it be bargained away. An intruder entered a residence on Long Branch Avenue, near Sunset Cliffs Blvd, Sunday (Dec 6th) night at about 10:30p.m. A woman and man confronted the intruder with a baseball bat. A struggle went down, and the woman was shot in the leg and later hospitalized. The intruder, hit in the head, got away. 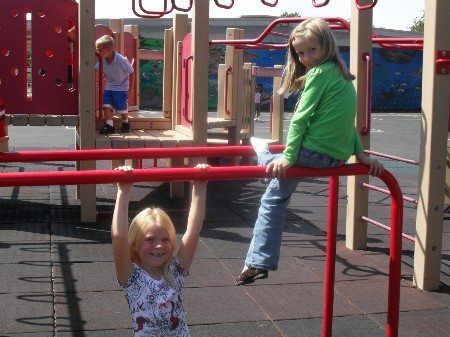 Kids play at OB Elementary School. Too close for med herbal dispensary? San Diego police Officer Dino Delimitros told media that the woman’s wound was not life-threatening. The Medical Marijuana Task Force has recommendations that medical herbal dispensaries should not be within 1000 feet of any school. If this recommendation is accepted, it would mean that Newport Avenue’s new dispensary, housed in the old OB Hardware storefront, would potentially have to move. The dispensary, the Wellness Center, is situated less than 500 feet from the southwest corner of OB Elementary School. Our tech staff has figured out that to be compliant, the dispensary would have to move down to the next block, closer to the OB Hostel. That will make them happy, at least. San Diego City Beat has nothing but good things to say about Bob Allen’s new hot dog stand, OB’Kanobe’s, in the Apple Tree parking lot along Cable Street. Allen told the mag that his is “the only venue in the country” that serves all the major brands as a matter of course: Hebrew National; Vienna; Sabrett; the Jennie-O turkey wiener; and even a soy dog. 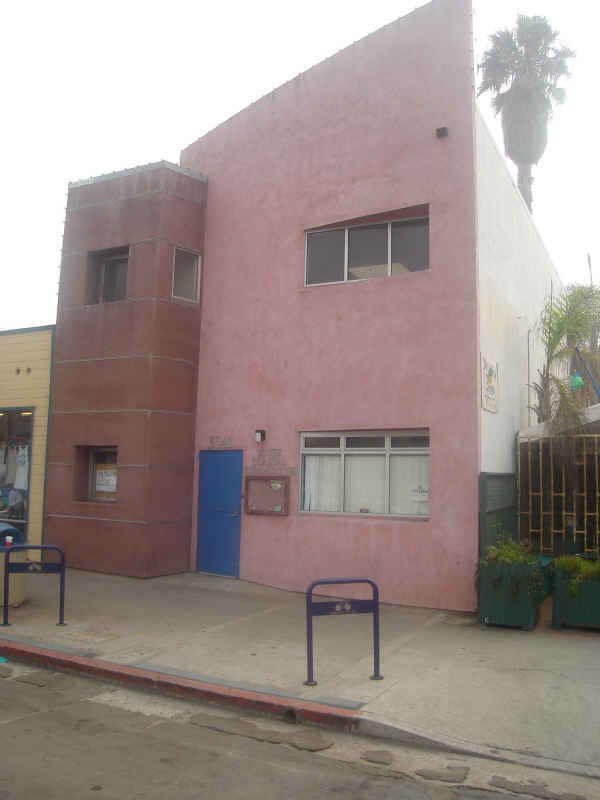 The old Community Services building, the two-story pink stucco place at 5041-5043 Newport Avenue, has been sold to Mike and Deena Tajran, of 1934 Via Casa Alta, La Jolla. Mike Tajran is the owner of Newport Pizza, the popular spot across the street, who plans to open a restaurant at the new location. The 1,760-square-foot office building sold for $830,000. The building once housed the famous and colorful Inbetween, OB’s “drop-in” center for youth, which was a friendly non-profit center for the young of the street back in the late Sixties and Seventies. Frank Gormlie, our editor, and OB Rag supporter, Dickie Magidoff, both worked there, albeit at different times during the 1970s. At some point, the old Inbetween was given a make-over and the result was the current sterile, forbidding, fortress-like structure that remains today. It has stood empty for a couple of years now. We’re glad Tajran will be doing something with it. Although, we wonder how many beer and pizza places that block of Newport can handle. Had a chuckle at your memories working at the Inbetween…. LOL! Psychedelic prime time! I just threw that in there to see if anyone was ‘listening’. LOL. Sure I remember the ol’ Inbetween. I think the OB Town Council had something to do with opening it. Back in 68 and 69 a lot of kids were hanging out on Newport and the Wall with no where to go. So town folks organized a drop-in center, obtained the building, painted it up, fixed the interior just enough to be used, and opened the doors. 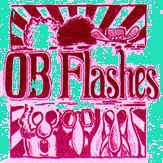 OB didn’t have “homeless” back then, we had “street people”. The Inbetween was a way to get some of that younger crowd off the streets. actually it was, in part, sponsored by the Methodist church, at least when it existed on the other side of Newport. I used to read poetry there on Sunday nights. Stay tuned for more on the old Inbetween. We’re now waiting on Dickie Magidoff’s reminiscences. distance is for a liquor store? I fail to see how it really matters. Kids can’t walk in and buy weed anymore than they can buy liquor. Are they going to make the Rite Aid move too? They sell far stronger drugs! None of Rite Aid’s drugs are gateway drugs that lead to harder stuff. Have some common sense. Now the kids are going to have to walk an extra block to score. Actually the first time I got high and knew that I wanted harder stuff was with nitrous at the dentist office. We should close them all down. For the children. Don’t you dare close those funny-laughing-gas dentists! They are so hilarious… or was it me? Sorry, dentists are a danger to children. They have to go. I just spoke with someone at ABC – Alcohol Beverage Control department (619-525-4064) – regarding the required distance between a liquor store and a school. I was told there is no physical limit, but they are authorized to deny a store’s application if it adversely affects the schoolchildren. Do they pass by it on the way to school? Is it close but on the other side of a freeway? So, sounds like ABC does an analysis on how it affects the kids, rather than simply take a physical measurement. Going way back….was there any public protest over the opening of gasoline stations next to the school? When I was a kid, there were stations on 3 corners there. Pew! And that was when we had leaded gas. Geez, Larry OB, that was SOOOO long ago, people had never heard of ‘protestin” LOL. hell, back then we snorted leaded gasoline. Regarding the dispensary, did the OBRag staff measure the distance from the OB Hostel area to Sacred Heart Academy on Saratoga. Might be within 1000 ft.
Oooh, yeah. That’s cutting it real close too. Google maps it at about 980 feet. sacred heart academy alumni 1958….Sister Mary Rita Clair….The ping pong paddle in the nurses room…Hey Does Kenney Boyd still have the little resturant down by the old lifeguards office? Do you mean the really old lifeguard station, the predecessor to the current one? Where was it? Way before Hodad’s there was a candy, burger, fries and soda place downstairs from the lifeguard station, I think. I heard, thru the grapevine, that they had to remove something, due to some copyright…. The OB Rag blog was down for about 23 minutes late this afternoon, in case you couldn’t find us. It was a data base problem. I like that picture Jim G. took and even saw it on one of the local news stations a few days back. I had to laugh when the anchor didn’t know what a Dobro was though…. He’s got the sounds and sites that put you right in it. Happy holidays to you all who put it together…. epic video of our first winter storm….loved it! Newer Article: Get a break on your electric bill – more people qualify than you might think.